Satanic cults, the energy crisis and roller disco were all part of the national consciousness in the 1970’s. Let’s also not forget the panic over the impending arrival of killer bees from South America. It seems silly in retrospect, but The Swarm (1978) exploited a genuine fear of the time. What it’s all about: After a missile base is mysteriously attacked, General Richard Widmark and Major Bradford Dillman encounter the only person left alive in the facility, entomologist Michael Caine. Honoring cinematic conventions, the scientist and military General instantly mistrust one another. Director Irwin Allen, an expert at action sequences, seems to give his cast free reign in their acting choices. Consequently, this is just the first of many moments where Widmark and Caine engaging in an over-the-top shouting match. Katherine Ross, playing the worst military doctor in history, corroborates Caine’s story that the base was attacked by a swarm of African killer bees. Two military choppers (well, helicopter models) are soon brought down by the same swarm that attacked the base. In the pastoral countryside, a stunt couple and their son set up a picnic lunch while a bee watches them closely. Really. There’s even a shot of the bee’s segmented point of view. Paul watches from the safety of the family car as his parents are covered by the killer insects. Barely escaping and delirious from a bee sting, Paul crashes the family car in the town square of nearby Marysville, where the local citizenry are preparing for the annual flower festival. An inordinate amount of time is spent setting up the love triangle between retiree Ben Johnson, school marm Olivia de Havilland and Mayor Fred MacMurray. Young Paul is taken to the hospital where, as if on a bad acid trip, he hallucinates about giant bees. At the gates of the missile base, Widmark must confront angry hick Slim Pickens, who demands to see his son. Pickens weeps over the body. The scene manages to be somewhat touching, but quickly turns ridiculous when the bleary eyed yokel picks up the body bag with every intention of carrying it home. Incredibly, Widmark lets him walk out the door with it. In another shouting match between Widmark and Caine, Widmark bellows about airdropping poison on the swarm. The fight ends with Caine screaming about the ecological ramifications of such a plan. In this round of scenery-chewing it’s Caine 1, Widmark 0. Recovered from his earlier bee attack, Paul goes out looking for the swarm. He and his two friends succeed where the military search operation has failed. They find the swarm and firebomb the hive, but only manage to anger the bees. The swarm heads for Marysville. Sleazy reporter Lee Grant watches from the safety of her news van as the bees attack helpless townspeople. The camera grotesquely lingers on a group of schoolchildren as they are stung to death in the school yard. But try to suppress your laughter as de Havilland watches her dying students through a bee covered window and acts, Acts, ACTS! “Nooooooo!” she cries, all in hilarious slow motion. Before she can board the evacuation train, Duke (of course) goes into labor. As the train gets under way, de Havilland has a premonition, “I got a sudden feeling I’ll never see Marysville again … I can’t shake this feeling that something is closing in on all of us.” This is of course an open invitation for the bees to attack, which they obligingly do. The train careens out of control and jumps the track. Johnson and MacMurray (well, their stuntmen) get tossed out the window as the train tumbles down a cliff and blows up. Proving that Hollywood legends are just as capable at hamming it up, Fonda self injects his experimental bee venom antidote and vividly dictates the results as they occur. Ross joins Fonda after what appears to be a successful trial run, but he quickly relapses. Once again Ross upholds her Hippocratic Oath by running to get help. Even though Fonda is obviously stone cold dead, Ross administers oxygen, as if it might help. Where did this woman receive her license to practice medicine? M.D.’s “R” Us? A nuclear power plant is directly in the path of the oncoming swarm. Richard Chamberlain tries to convince Jose Ferrer to shut down the facility. “The odds against anything going wrong are astronomical.” Ferrer insists. “Is there any provision against an attack by killer bees?” Chamberlain asks. Before Ferrer can answer, the alarm sounds, the bees attack and the plant inexplicably blows up! Our scientific team gathers at the new command center in Houston. As the bees blanket the city, the military sets Houston (in reality, only a small portion of the Warner Bros. back lot) ablaze with flamethrowers. “We’ll use this very sound to pull them out of Houston.” But before Caine can initiate his plan, the swarm invades headquarters. Widmark, brandishing a flamethrower, helps clear the way for Caine and Ross to escape. As tankers flood the Gulf of Mexico with oil, sonically outfitted helicopters lead the bees, pied-piper style, out to sea. Ross and Caine watch from shore as the gulf is set ablaze and the swarm is destroyed. In conclusion: In case you hadn’t laughed enough already, this disclaimer appears in the end credits. The African killer bee portrayed in this film bears absolutely no relationship to the industrious, hard-working American honey bee to which we are indebted for pollinating vital crops that feed our nation. What exactly were the producers trying to prevent? A series of honey bee hate crimes or a backlash from supporters of the honey-nut Cheerios bee? The Swarm DVD is nicely presented in its widescreen format with crisp, bright hues that bring to mind the colorful campy atmosphere of Allen’s television work. A trailer is included along with the vintage featurette Inside the Swarm, which contains some nice behind the scenes footage of the more memorable action sequences. 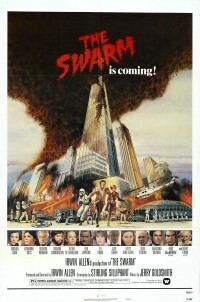 With its utter disregard for believability and scientific fact (a thesis could be written on the countless errors) and an all-star cast that takes every opportunity to chew the scenery, The Swarm is one of the zaniest disaster movies to spring from the fertile mind of producer/director Irwin Allen.